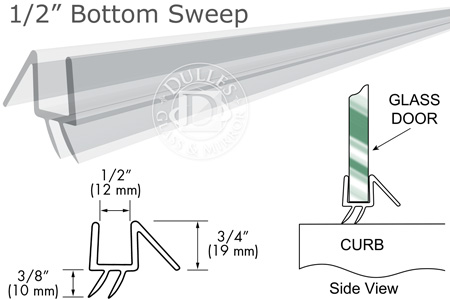 36" Clear Bottom Sweep with Drip Rail for 1/2" Glass is a bottom wipe for 1/2" Thick Glass Shower Doors. Recommended for use with both Single, Inline 180 degree, and 90 Degree Shower Door installations. Used horizontally as a bottom sweep (soft wipe acts as a water resistant seal). Easily snap on bottom of glass door. Achieves a functional and sleek look for shower doors. Comes in convenient length of 36 Inches. Keeps the water inside your shower with drip rail by deflecting water back into shower stall, while giving your shower enclosure a clean look. Clear Color. Mfg. by Troy Systems in the USA. Shipped by UPS. Perfect for do-it-yourselfers.